Making empanadas at home is a snap! We'll take you through it step by step, and share a few surprise ingredients that complement the turkey perfectly. Heat dressing in large skillet on medium-high heat. Add turkey, onions, carrots and garlic; cook 5 to 7 min. or until turkey is cooked through, stirring occasionally. Remove from heat. Stir in beans, cheese, cilantro and pepper; set aside. Preheat oven to 400ºF. Unroll 1 of the pie crusts on large baking sheet sprayed with cooking spray. Spread half of the turkey mixture onto half of the crust to within 1 inch of edges. Fold crust in half to enclose filling. Fold over 1/2-inch-wide rim around pastry to seal all edges. Repeat with remaining pie crust and filling. Cut several slits in top of each to permit steam to escape. Bake 25 min. or until golden brown. Cut each empanada into four wedges to serve. Serve one of the empanadas for dinner. 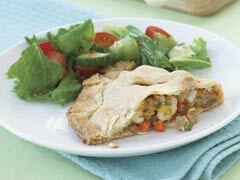 Cool remaining empanada, then cover and refrigerate until ready to serve the next day for lunch. Reheat in microwave before serving. Substitute 2 chopped serrano chiles for the ground red pepper. Spice up your mealtime with these easy-to-make empanadas. Serve with a mixed green salad to round out the meal!